Heard of Jack Gregory ? ~ the stylist Sunil Gavaskar bowed out of Cricket in style. In his last of the 125 Tests, he made a valiant 96 at Bangalore and in his 108 ODIs, he made only one century and that came in his penultimate match – against NZ in WC 1987. Christchurch is the largest city in the South Island of New Zealand, and the country's third-most populous urban area. It lies one third of the way down the South Island's east coast. The city was named so in Mar 1848 by the Canterbury Association, which settled the surrounding province of Canterbury. The river that flows through the centre of the city was named Avon commemorating the Scottish Avon. The usual Māori name for Christchurch is Ōtautahi ("the place of Tautahi"). The World Cup 2015 kicked off at Christchurch and the hosts New Zealand had an emphatic win mauling Sri Lanka by 98 runs. The first recorded match on the ground was in 1867, when Canterbury cricket team hosted Otago cricket team. The city was hit by a major earthquake in 2011. In the Trans-Tasman Trophy, in Test no. 2202, Kiwis playing first were all out for 370. At one stage, they were 32/3 when Bazz, playing his last Test stepped in. It is but common to write good of a player playing his last match, that too someone who has just completed 100 landmark. It is reported that Brendon McCullum was once an incredibly good rugby player. He was picked in front of All Blacks great Dan Carter at fly-half in the South Island secondary schools team in 2000. The selectors "clearly got it wrong," McCullum quipped in 2014, after he became the first Kiwi to score a triple century. In Jan 2014, against India at Wellington, McCullum showed he could put aside his batting belligerence and instead graft away for the good of the team. India led by 246 on the first innings and had New Zealand at 94 for 5 in the second before McCullum began a near 13-hour stand in which he made 302, the only Test triple-century by a New Zealander, and saved the Test. He faced 559 balls and hit 32 fours and four sixes. Today he faced 79 balls, on 54 – he scored a four and that made history. Brendon Barrie McCullum born in 1981 has niche in Test Cricket. The wicketkeeper batsman has made 11 centuries ~today’s was special. 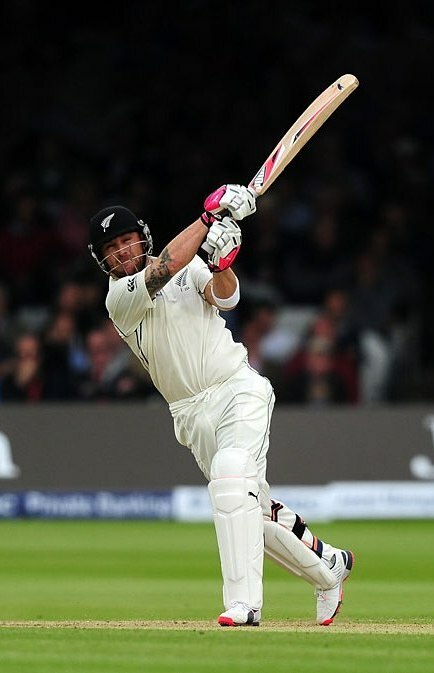 Brendon McCullum has blasted the fastest century in Test history, a 54-ball effort that broke the record jointly held by Viv Richards and Misbah-ul-Haq. In his 101st and final Test match, McCullum attacked Australia's bowlers relentlessly and brought up his milestone by crashing a four over cover off Josh Hazlewood. McCullum celebrated to a standing ovation from the crowd at Hagley Oval in Christchurch, raising his bat to all parts of the venue in his adopted home-town. The 34-year-old was actually dismissed on 39 when Mitchell Marsh produced a superb diving catch in the gully but was reprieved when television replays showed James Pattinson had bowled a no ball. Jack Morrison Gregory played in 24 Tests between 1920 and 1928. He was known mainly as a fearsome right-arm fast bowler but he also achieved a batting average of 36.50 and 1146 runs including two centuries, batting left-handed and gloveless. At the Johannesburg Test in 1921 he scored a century from 67 balls in 70 minutes, which was at the time the fastest hundred in terms of both balls faced and minutes taken in the history of Test cricket. The record stood until 1985 when Viv Richards managed the feat with 56 balls but it remains the record for the fastest hundred in terms of minutes.